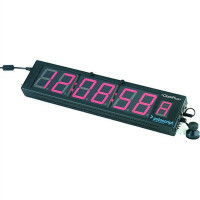 Timecode Display Unit LED Six Digit On Air Time or Countdown display. Interfaces to Studio Time code, combined with Tally Light function. Tally's green to red. "Includes 2 x Mini Jack cables and hardware to frontmount to 12"" - 19"" prompters."